Prior to his appointment as Ambassador of the Republic of the Philippines to Singapore, H.E. Joseph Del Mar Yap was a successful business executive with more than 40 years of experience in the private sector. Mr. Yap was also the Special Envoy of the President to Singapore from November 2016 to June 2017. Ambassador Yap earned his Bachelor of Science (Honorable Mention) in Management Engineering from the Ateneo De Manila University. He earned a Master’s in Business Administration (MBA) at the Harvard Business School, on a full scholarship. He is married to Madame Lourdes Josephine Gotianun Yap with whom he has 3 children. Ambassador Yap hails from Cebu City. Amb. Tomas C. Benitez was the Philippine Ambassador to Singapore from 1966 to 1967. A lawyer by profession, he was formerly the Chief of Protocol and was posted in Washington, D.C.
Amb. Delfin R. Garcia was a BS Foreign Service graduate. His previous postings included Shanghai, UN, Chicago, Saigon, Kobe, Tokyo, and The Hague before his assignment to Singapore from 1971 to 1978. Amb. Privado G. Jimenez was a lawyer who also served in the Department of Justice. He was posted to the UN and Ottawa until his assignment to Singapore from 1978 to 1985. Amb. Francisco L. Benedicto is a native of Cebu. His Singapore stint from 1986 to 1993 was his first ambassadorial posting, which were followed by his postings to Seoul, Brasilia, Ottawa, New Delhi and Beijing as ambassador. Amb. Alicia C. Ramos was a career diplomat who served in Singapore from 1993 to 1996. Her previous postings were in Beijing and Rome before being appointed ambassador to Bucharest, Singapore, and Wellington. Her last office assignment in DFA was Assistant Secretary for Asia-Pacific Affairs. Amb. Alberto A. Encomienda was a career diplomat and lawyer. His previous postings were in the UN, Abu Dhabi, Ottawa, before being appointed as ambassador to Athens and Kuala Lumpur. Singapore was his last ambassadorial posting from 1996 to 1998. Amb. Jesus I. Yabes is also a career diplomat and lawyer, who last served as DFA Undersecretary for Migrant Workers Affairs. He was posted in Hong Kong and Tokyo before being appointed ambassador to Singapore from 1999 to 2002. Subsequent postings include as Consul General in Shanghai and Ambassador to Islamabad. Amb. Ernesto V. Llamas was a UP alumni with BS Foreign Service and MPA degrees. He rose from the ranks in DFA, with postings in Kuala Lumpur, Baghdad, Washington, D.C., and Canberra. He was ambassador to Wellington, Islamabad, Tehran, before being posted to Singapore from 2002 to 2003. His last ambassadorial posting was in Moscow. Amb. Belen F. Anota was another career diplomat and lawyer who served in Singapore from 2004 to 2008. She twice served in Tel-Aviv, as well as being posted to Jakarta, Tokyo, and Canberra. Her last office assignment in DFA was as Assistant Secretary for Strategic Planning and Policy Coordination. Amb. 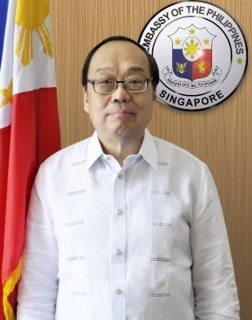 Minda Calaguian-Cruz twice served in Singapore, with the last one as ambassador from 2008 to 2014. Her early postings were in London, Beijing and Hong Kong. She capped off her career in DFA as Assistant Secretary for Asia-Pacific Affairs before being appointed as ambassador to Canberra. Amb. Antonio A. Morales is a UP Business Economics and Law graduate, who also pursued his Master’s in International Relations at the Escuela Diplomatica in Madrid. Singapore was his first ambassadorial posting from 2014 to 2017. He was earlier assigned to Ankara, Rome, Kuala Lumpur, San Francisco, Milan and Beijing. He is currently the Consul General in Hong Kong.